It is a Roll of Honour of men who have answered their country’s call in defence of a Scrap of Paper. It then goes on to explain.This document is a translation and facsimile of signatures from the original treaty of 1831 guaranteeing the independence and neutrality of Belgium, which was confirmed by the six powers in the famous treaty of 1839, the breaking of which by Germany is responsible for the present war with the British Empire. 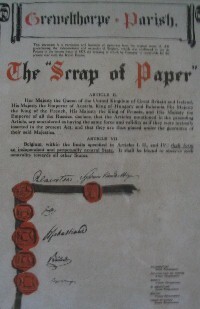 “The Scrap of Paper” Article Her Majesty the Queen of the United Kingdom of Great Britain & Ireland. His Majesty the Emperor of Austria, His Majesty the King of Hungary & Bohemia. His Majesty the King of the French. His Majesty the King of Prussia. His Majesty the Emperor ofall the Russias. Declare that the Articles mentioned in the preceding Article, are considered as having the same force and validity as if they were textually inserted in the present Act and that they are thus placed under the guarantee of their said Majesties. Article VII Belgium within the limits specified in Articles I, II and IV shall form an independent and perpetually neutral state. It shall be bound to observe such neutrality towards all other states. This document was signed by:-Palmerston. British Plenipotentiary. Sylvan Van De Weyer. Belgium Plenipotentiary. Senfft. Austrian Plenipotentiary.H. Sebastiani. French Plenipotentiary. Bulow. Prussian Plenipotentiary. Pozzo Di Borgo. Russian Plenipotentiary.The document then lists all the Grewelthorpe men and women who served in WW1. Leathley Wm.G. 2nd Lieut. Som. L.I. , 1915. Hammond John T. , West Yks. 1916. Waite Fred. Middlesex Regt. 1917. Of these men, the 1901 census tells us that Herbert Thwaites was born in 1890 and was the son of Joshua Thwaites [stonemason] and Ann. Living in Kirkby Malzeard.Fred Waite was born 1899 in Grewelthorpe. Son of John Waite[Roadman] and Ellen. Brown Henry G. ,[M.C.] Lieut R.E. 1914. Coldbeck Lawrence. Sergt RAF	1916. Gale Frederick. , West Yks. 1914. Gale Thomas. , West Yks. 1916. Hartley Harold C. R.A.S.C. 1914. Jackson Joseph. Corpl. R.A.S.C. 1916. How Lieutenant H. G. Brown won the Military Cross. The following is the official account of the services for which the Military Cross was awarded to Lieutenant H.G.Brown, fifth son of the late Mr. Joseph Brown of Hill House, Fountains, Ripon and Mrs.Brown, The Green, Grewelthorpe. “For conspicuous gallantry and devotion to duty at Essorts, April 3rd 1918. The headquarters of the Brigade, the signal section of which was commanded by Lieut. Brown , was shelled constantly throughout the day. In spite of this Lieut. Brown succeeded in maintaining communications both forward and to the rear. He displayed most conspicuous gallantry in supervising the work of his section under heavy and continuous shellfire, on many occasions himself repairing the broken wires. Never throughout the day did he consider the enemy’s fire or his own personal safety, so long as his command stations were complete.